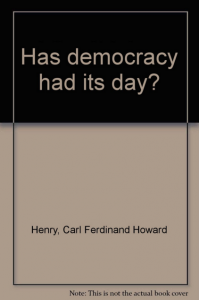 Has Democracy Had Its Day? As I read this diminutive book, I wondered what caused Richard Land (SBC Christian Life Commission) to call Carl Henry “the twentieth century’s greatest evangelical theologian” and then to declare this book “to be one of the most important things ever written by Dr. Henry.” The book has some interesting points concerning democracy as Henry debates the value of various forms of government within a Christian perspective and more directly whether democracy is ordained of God or merely conducive to God’s purpose. I did not see that this book was as important or pithy as many of Henry’s earlier tomes. He never absolutely answers the book title’s question but merely advocates that for democracy to survive Christians must be politically active. Certainly there are better books. But if you are seeking political activism from a Christian perspective, this may be for you.